I began my work on psychoeducation in schools. I worked with whole classrooms of students, from first through sixth grade. I worked with after school programs and taught methods to teachers who very successfully used these methods in their classrooms. I have conducted “pull out” programs with individual children in schools. In recent years it appears that teachers and principals have had less freedom to choose what to teach. There has been more pressure to “teach to” standardized tests. It was partly in response to the political and bureaucratic difficulties encountered in schools that we began to bypass schools altogether, and deliver services by phone, directly to students at home. The need for psychoeducational curricula in schools is, however, extremely large. The estimates of the fraction of children with “serious emotional disturbance” vary widely (see, for example, Brauner and Stephens, Estimating the Prevalence of Early Childhood Serious Emotional/Behavioral Disorders: Challenges and Recommendations, Public Health Rep. 2006 May-Jun; 121(3): 303–310.) But we know that even according to the lowest estimates, U.S. children with “serious emotional disturbance” number in the millions. And we are also quite sure that psychoeducation can benefit millions of children who have no identified emotional disturbance at all. Indeed, we believe that principles of anger control, conflict resolution, friendship-building, decision-making, emotional regulation, and the like can be usefully taught to almost 100% of children. We hope that the teachers out there who have the freedom – or the mandate – to teach psychological skills will find this page, and feel free to get in touch with us by email. In this section of the website we give a sampling of our curricular materials that may be used in schools. These include both activities intended to strengthen psychological skills directly and some that teach foundation level skills for reading, as reading difficulties and behavioral and emotional difficulties are close relatives. But there is too much to include here. Interested teachers may get more, directly from us. Phonemic awareness (segmenting and blending) and spatial awareness (image versus mirror image, left versus right skills), along with oral language skills, make up important foundations of reading. It's very important to get these skills firmly in place, early in children's reading careers. This first set of activities focuses on building these skills, as well as letter-sound correspondence. Do your children need to learn what sounds the letters make? Get in touch with your inner performing star and encourage your students to do the same, and we'll be very surprised if these activities aren't both: successful in teaching the letter sounds, and lots of fun for you and your students! The letters, in this book, are humanoids that look like letters with arms and legs and eyes. They can speak to each other just fine, but to humans, they can only say their phonetic sounds. They say their sounds separately, and then they get together to say the blended word. So this book offers lots of examples of “sounding” and then “blending,” in the context of these stories. Click here for excerpts, etc. In this magic trick, you grab some colleague – a staff member, fellow teacher, administrator, parent – to come into your classroom for just a couple of minutes. If you want, you can clue the person that their job is to act skeptical that this trick will be possible, and then to act amazed when it does work. 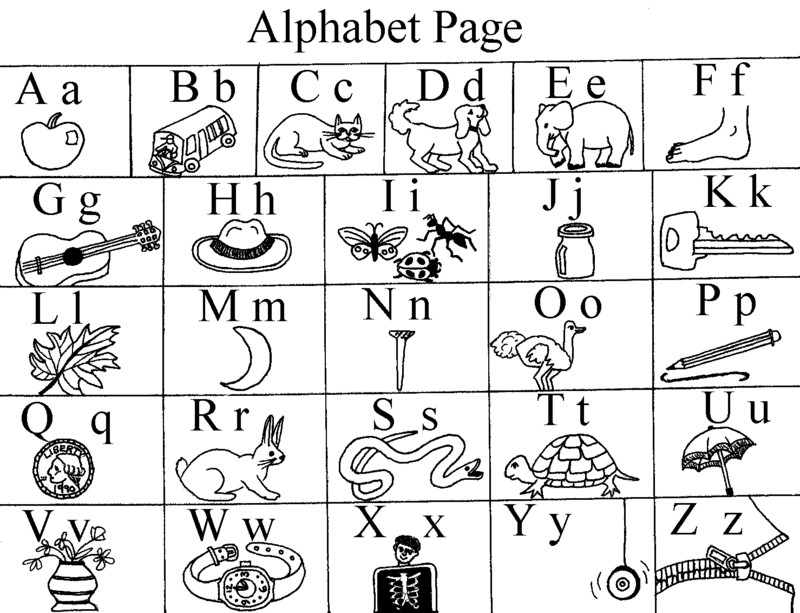 The visitor comes in and is asked to look at the alphabet page (or your alphabet chart) and silently pick one of the pictures or one of the words, and then carefully to write down the pick so that none of the students can see it, but you can. In our Manual for Tutors and Teachers of Reading, there are 587 sentences (beginning on page 178) that end with a word suitable for your segmenting (or splitting up into the separate phonemes) and the students guessing by blending the sounds together. You just read the sentence and say the last word segmented, and call upon a child to guess the word. In part 1 of this exercise, you segment one of your student's names, and the students guess who it is. For example, if a child is named Richard, you would say rrr-ih-chuh-ar-duh. If you want, you can call on one student to guess, or if you prefer, you can figure out ways for everyone to guess at once – for example everyone looks at the person, or everyone points to the person, or if you want to have some silly fun and think your kids can keep things under control, you give everyone a foam rubber ball (or a wad of paper) and everyone throws their ball to the person. Part 2 of this exercise can be done when the students have heard you segment their names enough to be able to do the segmenting themselves. You pick student #1 to think of the name of student #2, and to segment that person's name. Then you call on student #3 to blend those sounds so as to guess who the mystery student is. Then it's student #3's turn to do the next segmenting. An introduction to the collection of activities presented in the Manual. Including activities with pictures, left and right discrimination activities, "b" and "d" differentiation activities, etc. More information on the activities in the Manual that involve pictures, and two in particular: "Same or different?" and "Which picture is not like the others? Click for more excerpts, etc. Once learners can say the most frequent sound for each of the 26 letters, and once the foundation skills of phonemic awareness and spatial awareness are on solid footing, an extremely useful exercise is “sounding and blending” with “word lists.” In the Manual for Tutors and Teachers of Reading is a series of word lists, ranging from very easy to fairly hard; the learner works the way from the lowest to the highest points of the hierarchy. Sounding and blending means saying the sounds of each of the phonemes in the word, then blending them together to say the word. After a good deal of skill in this is gained, the learner can sound and blend by syllable rather than phoneme. Word list work of only about 10 minutes a day can reap large gains in reading recognition. Since word list work puts demands on self-discipline reserves, it's good not to stretch it out too long. We have had many, many successful experiences when such work is carried out individually. One way for such work to be done individually is by training older children to do word list work with younger children. As soon as learners get enough reading recognition skill to start reading connected text, such as stories, then, in our opinion, is the time to start introducing stories that model psychological skills. The Reading manual contains illustrated stories that involve short vowel words only, where the characters exemplify one or more psychological skills. The learner moves up word lists, and moves up the hierarchy of difficulty also in reading stories. The three central components of our phone psychoeducational session are 1) alternate reading, 2) skills exercises, and 3) social conversation. These are directly translatable into classroom activities. The first level programmed manual is Programmed Readings for Psychological Skills; the next is the Friendship-Building and Social Skills manual. The programmed manuals on Anxiety, Anger Control, Self-Discipline, Psychological Skills Exercises, and Being a Successful Student are a step above in language complexity. A really simple activity, that can do much good, is for you to simply take a certain time each day and read aloud from a programmed manual to your students, calling on them to answer the comprehension probe that occurs after every minute or two of reading. You don't need any preparation for this, (other than to psyche yourself up for reading enthusiastically, and being very reinforcing when your students answer the questions correctly) or any lesson plan. In fact, one of our challenges with tutors has been to get them to refrain from quizzing and lecturing and further didactic activity, but just to let the instruction in the manuals be enough. If the students want to comment on what they are hearing, welcome those comments with open arms. In variations, you can have students take turns reading the manual aloud to the rest of the class. You can have students, of different ages or of the same ages, divide up into pairs, and do alternate reading with each other, just as we do in tutoring. Another variation involves a computer program that presents each section of the manual one at a time, prompts the learner to respond with an A or B answer, and then gives feedback as to whether the answer was right or wrong. If the answer was wrong, the learner is asked to read the section and answer again. At the end of the session, the program gives the total number attempted and the number gotten right. This program will run on old or new computers running Windows, as far back as back as Windows 95, if anyone has such, wasting away in a basement or garage. You can amass several old clunkers for very little money through Ebay, and have work stations that give lots of individualized practice in both reading comprehension and psychological skills. By picking the passages judiciously, you can individualize the level of difficulty that the learner encounters. If you're interested in trying this, get in touch with us. Two books in our curriculum describe psychological skills exercises thoroughly: Exercises for Psychological Skills, and A Programmed Course in Psychological Skills Exercises. In addition, there is more on how to do the exercises in the Anger Control manual, the Anxiety manual, and the Self-Discipline manual. Further explanation of certain exercises are provided below. It's not easy to do these well and to teach others to do them well. Careful reading of the examples in the manuals will pay off. But the brief descriptions here should give you a taste of things, so that you can decide whether you want to delve further into these. The psychological skills exercises can be adapted for classroom use in at least three ways. First, the whole group can do them together. You can pose the question or challenge, and call on various students to contribute to the answer. Second, you can divide children into pairs and let each pair do the exercise together. And third, you can make the exercise into a written assignment, where you give the question or challenge and the students write their responses. To adapt this component of the curriculum for classroom use, you can use any of the three methods used for the exercises. You can 1) hold a classroom wide discussion, on any topic, shifting topics as you please, just for the fun of it; 2) divide the children into pairs and let them chat with each other (be ready to see lots of them look at a loss on how to do this) or 3) you can give a writing assignment in which the task is to take two characters, of your choosing or the student's choosing, and have them chat with each other and get to know each other better. This next set of activities expands on these three further. The songs on the collection called “Spirit of Nonviolence” were made with classrooms in mind. If you've looked at the activities for the Letter Sound Songs, in the reading section, the activities for the Psychological Skills Songs are very similar. You can get these songs from the following page of our website. They will usually sound better over speakers than over the internal speakers that come with a computer. As your students learn to read, they can practice learning to read the brief statements of what the 16 skills and principles mean, as follows. This version is from page 8 of Programmed Readings for Psychological Skills. Reading the definitions of the 16 skills and principles is a great start, but it's not the major way that children learn the meanings of these terms. The main way is by hearing lots of concrete examples of them, and by linking the examples to the words for the skills. While they are doing this, they are loading into their memory banks lots of positive examples of the skills. This document goes into methods of doing this with stories and plays. Many of our activities have to do with helping students experience positive examples of psychological skills: productivity, joyousness, kindness, and so forth; this is the point of the Illustrated Modeling Stories, the Plays, and the stories in the first part of Programmed Readings. In the celebrations exercises, we draw upon another source of positive models: the students' own positive actions. When children have heard lots of stories that model the sixteen skills and principles, they are ready to start making up their own. Now the question is, “Can you make up an example of something that someone could do, that would be a smart or good thing to do, that would model any of our sixteen skills?” You can respond to these just as with the celebrations exercise or with celebrating others' choices. As with all spoken exercises, at some point the students will be ready to write down their own stories. My advice is not to jump to this stage prematurely. If they find it fun to write down their own stories, that's a good sign that you haven't done it too soon. A variation of skills stories is “skills stories with pictures.” In the past I got pictures by actually cutting them with scissors out of magazines. Now you can find a huge array of pictures on the Internet and print them out or electronically transmit them. The task of the student is to make up a story about a certain skill, that goes with the picture that they are randomly given. Pictures involving people will be better prompts for stories than pictures of objects or landscapes. Our recommendation is to teach children keyboarding (a.k.a. typing) skills early in life. If you do, and if your children have access to computers, this makes it easier to collect an every-grown anthology of positive models that your children have come up with. This anthology can be read by both present and future groups of students. In my opinion, the creation and compilation of hundreds of positive examples of psychological skills is a very important activity for humanity. It enriches the person who does the task, as well as the others who read the output. The idea is that if you can consciously pick which of these thoughts you want to employ at any given time, your life will be enormously helped. Some people seem stuck in some patterns by reflex, and overdo them tremendously. People who overdo awfulizing can be very anxious and fearful; people who overdo getting down on themselves can feel guilty and depressed; people who overdo blaming someone else can have anger problems. But we don't want to get rid of these first three thoughts altogether! Fear, guilt, and anger can be extremely useful emotions, in the right circumstances and when not overdone. Other chapters of Programmed Readings teach four ways of listening to someone else: using reflections (such as, “So what I hear you saying is ____”) facilitations (such as Oh, uh huh, yes, I see, humh, OK) follow-up questions (such as “What happened after that?”) and positive feedback (such as “Thanks for telling me that,” or “Interesting point!”) These ways of listening form the basis of the reflections exercise, where one person speaks and the other person does a reflection every time the first person stops speaking. This is an exercise both for concentration and for empathy. The four ways of listening also form the basis of the “Listening with Four Responses” exercise, where again, one person speaks and the second person listens. But in this case, the second person uses any of the four ways of listening that they choose, rather than necessarily sticking to reflections. You can do either of these exercises with you as the talker and the whole class as the listener, where you call on a different student each time to do the listening response. Or you can pick a student to be a talker and do it the same way. Finally, you can divide the students up into pairs and let one of them be the talker and the other be the listener, so that they all practice at once. Physical aggression and lack of anger control are huge problems for schools. But even for the children who have the worst problems in this area, how many receive systematic instruction and structured practice in the skills of fortitude, nonviolence, and anger control? The manual, A Programmed Course in Conflict Resolution and Anger Control, is meant to be a textbook, not only for children with aggression problems. A small fraction, but a very effective part, of this book involves teaching children to do the four thought exercise with “provocations.” A provocation is a situation that could possibly make someone angry: someone cuts in front of you in line; someone calls you a dork; a teacher punishes you for something and doesn't punish the other kid who did something much worse; a parent nags you to do something; a sibling interrupts you; etc. There is a list of several hundred provocations in an appendix to the Anger Control book, and these are meant to be used for repetitive drill and practice. The four thought exercise is to apply four types of thoughts, in order, to the situation you are practicing with: not awfulizing, goal-setting, listing options and choosing, and celebrating your own choice. These are a subset of the twelve thoughts we mentioned earlier. In addition to lots of four thought exercises with provocations, lots of Dr. L.W. Aap role-plays with conflicts constitute further useful drill and practice in the anger control arena. Doing lots and lots of practice with hypothetical situations is a wonderful way to build up habits of anger control. Of course, a prerequisite is that the learner is convinced that nonviolent solutions are desirable; that it is not necessary to fight for dominance at every turn; and that friendly relations with others can be fun. It also is useful for the learner to have been taught ways of generating nonviolent options for use in provocations. And there are various other prerequisites. This is the reason why the anger control manual is a medium-sized book, and not just the paragraphs above! But the general strategy of practicing finding acceptable, useful, and workable nonviolent responses to provocations is what seems to work for anger control. This is in marked contrast to what repeatedly has been shown NOT to work: an attempt to get anger “out of the system,” to “release” or “vent” it. Skilled teachers may be able to do a four thought exercise with a provocation, with the entire class group, on a nearly daily basis. You read the situation to the class. You invite the class to give examples of not awfulizing, goal-setting, listing options and choosing, and celebrating your own choice. You display for the class some final form of each type of thought. For listing options and choosing, you get a variety of ideas from various students about what options exist. You explain to them that you don't want the class to waste time on violent or very disrespectful options, and if students propose them, you don't write them down. If the students can't come up with certain good, nonviolent options, you can propose them yourself, and write them with the rest. Then you can have a discussion about which option is best. You remind the students that there is usually no one right answer to the question of which option is best, and the answer may depend upon parts of the situation that we don't know about from the short description. But we want to choose one that is reasonable and nonviolent. It's good to save your written examples of the four thought exercise. You should be able to finish a four thought exercise fairly quickly – it's important not to drag it out and make it tedious. When you have come up with a number of four thought exercises that you consider exemplary, you can let the children read them aloud, to practice their oral reading. Such readings aloud can be a warm-up for a written exercise wherein you give a hypothetical provocation to the class and each child writes a four thought exercise for that situation. 1. Defining. Each person defines the problem from his or her point of view, without blaming, and without telling what the solution should be. 2. Reflecting. Each person reflects to let the other person know he understands the other person’s point of view. 3. Listing. They list at least four options. 4. Waiting. They don’t criticize the options until they’ve finished listing. 5. Advantages. They think and talk about the advantages and disadvantages of the best options. 6. Agreeing. They pick one to try. 7. Politeness. They don’t raise their voices or put each other down or interrupt. After students have learned thoroughly about these criteria, by hearing lots of examples, the task is to let them practice conversations that meet these criteria. I've found a problem with getting pairs of students in front of the class to role-play these conversations, either with puppets or as actors – the audiences tend to reinforce slapstick hostility. Conversations that are rational enough to meet all seven criteria tend to be less entertaining for audiences than attempts at conflict-resolution that go awry. Perhaps this is the reason why you hardly ever run across a conversation like this in fiction. So the ways of practicing Dr. L.W. Aap conversations that I recommend include getting a student to role-play with you in front of the class; getting students to divide up into pairs and practice; having students write out conversations, and one other. The last one is surprising, for such a cooperative activity, and that is to have a competitive game between two teams. You divide the class into two teams, and pairs from each team take turns getting up and doing conflict-resolution role-plays. Each pair gets from 0 to 14 points (with you as scorer) depending on whether each person did or did not meet each of the 7 criteria. The team with the most points at the end of the time wins. If the teams can get into winning the game more than they are into entertaining the audience, they can intently try to meet the 7 criteria. Where do you get conflicts to practice with? I recommend NOT using conflicts that students actually are having with each other at the time. You want to practice with situations that are not emotionally laden. You want the students to use the Dr. L.W. Aap criteria enough times when they are emotionally “cool” that they can learn to transfer these habits to conflicts that are emotionally “hot.” There's a list of many hypothetical conflict situations to practice with in an appendix to A Programmed Course in Conflict-Resolution and Anger Control. You notice that doing the twelve thought exercise, the four thought exercise, and Dr. L.W. Aap all involve listing options and choosing. The skill of coming up with options for what to do in a situation is a very important ability in and of itself, which deserves concentrated practice. You can present a hypothetical situation and ask the whole class to generate options, writing down the nonviolent and reasonable ones (with a fairly inclusive definition of reasonableness!) Or you can present the situation and ask all the class to write options. After collecting the papers, you can discuss what the children thought of, and collect the best options into one list. You can also get students' opinions on which options they think are best. After you've done brainstorming options, twelve thought, four thought, and Dr. L.W. Aap exercises, you let the students know that each of them involves a situation where someone, or more than one person, have to decide what to do. These situations can be “problems,” or “frustrations” or “provocations” or “scary situations” or “stresses” or even “lucky things happening,” or “unexpected good news.” Almost any situation we encounter makes us have to choose how to think and what to do. You let the children know that we need more choice points to do the exercises with. You give several examples of choice points yourself, and then you get the students to come up with lots more examples, while someone writes them down. Again, you can do this in 3 ways. You can have a brainstorming activity with the whole group, calling on different students to contribute a choice point. You can have the students divide up into pairs, and let the two of them generate choice points together, with at least one of them writing down the results. Or you can give a writing assignment in which children individually list choice points in writing, and hand them in so that you can read and compile them. In the Anxiety Reduction manual, a chapter goes over a good number of relaxation and meditation techniques. Most of these are done while the meditator is sitting. But school children are asked (or shall we say, forced) to sit, usually, for far longer a fraction of a school day than their bodies were designed for. “Meditation with movement” is therefore a really useful meditation technique for this group. A type of movement that I like involves standing up, clasping the hands, and either pushing the hands together or pulling the hands apart. The hands are moved from extending downward nearly to the floor, up to overhead. Meanwhile, the knees bend as the hands move down, and extend again as the hands move up. The whole motion sort of resembles picking some crop and putting it on a high cart overhead. The motion can be performed slowly or quickly, depending on how much of an aerobic load is desired. It can be done with eyes open or closed. Lots of different muscles are involved. Probably lots of other motions would work as well. Like meditation on a repeated mantra, or meditation on the sensation of breathing, the student attends to something that repeats itself over and over. There are two variations to this technique, having to do with what you pay attention to. In the first, you pay attention to the movement itself. You feel what your muscles are doing. If your mind drifts from the feeling of the movement itself, you gently and without self-recrimination, pull yourself back to attending to the movement. In the second variation, you let your mind do whatever it “wants to.” You let your mind pay attention to things in the room, memories, fantasies, worries, whatever. You just save part of your mind to pay attention to what the rest of it is doing. That is, you try to be aware of what you are thinking about. Like most activities of meditation, if one looks at this a certain way, the reaction is, “Oh, how boring.” You feel one movement, you've felt them all, right? Just as when you've noticed your breath going in and out one time, you've been there and done that and why do it over and over? Or you silently utter some exotic mantra word to yourself a few times, OK, you've done it, it's time to move on – let's get to something exciting like a video game. This is the natural reaction of many people to meditation techniques. So it's crucial to explain to students that their challenge is to figure out some way to make the repetitive movement not boring, but rather to make the repetitiveness of it induce a feeling of peacefulness and relaxation and calm, and other good feelings. It's hard for someone to tell someone else how to do this. Many, many people have caught on to how to do this. If the students keep at it, they may succeed in this rather mystical challenge of transforming one's attitude. And the benefits to those who learn to meditate can be very large – better emotional control, a feeling of serenity despite life's stresses, more freedom from stress-related problems, better concentration, more self-discipline, and improved relations have all been reported as results of meditation. Sometimes the trick is to feel the boredom and impatience, and just notice it, and stay with the activity anyway. When I teach meditation techniques to children, I don't push my luck in the boredom and impatience arena – I start with very short sessions – usually either one or two minutes long, and work the way up, but even then not to very long sessions. It's better to have short sessions that are pleasant than long sessions that are unpleasant. Kids who need to stretch will probably find meditation with movement pleasant just by virtue of being able to move. The Vision: As students generate the various pieces of writing alluded to here, these can be collected and held onto and organized into banks of materials that others can learn from and work with. The choice points students generate, for example, can be added to a growing list, which future classes can practice with. As this list grows, the choice points will reflect more and more closely the children's own life experience. As the children write celebrations, celebrations of others' choices, and skills stories, these become added to the growing set of positive models. As they write examples of social conversation, conflict resolution, twelve thought or four thought exercises, and others, these become added to an archive that can serve as models for future students. Hopefully, students can relish the feeling that they are writing, not just to fulfill an assignment, but to benefit lots of potential readers – which is what writing should be about. The Reminder: Stick to hypothetical situations for the most part. Classrooms are not the place for students to disclose intimate personal details of their lives. Classrooms are not group therapy sessions, and teachers are not therapists. One of the distinguishing features of psychoeducation, as contrasted with psychotherapy, is that you are not trying to solve particular problems in the students' lives. You are trying to work with hypothetical situations that employ the same problem-solving and decision-making skills that children use to solve their real-life problems. Most of the choice points that children contribute will be derived from their life experience. But it's good to render the situation generic and hypothetical by making it unidentifiable, adding or subtracting specific details, and waiting for some time to go by before doing exercises with those situations.